Bachchan’s—the go-to guy for voice-over—majestically looms over the historical introduction of the British coming to India with dis-honest intentions and taking over the Indian provinces, one by one, until they lay their eyes on Jhansi, and face the biggest pain and obstacle as documented by Field Marshal Hugh Rose, in the form of Rani Laxmi Bai, a.k.a. Manikarnika, fondly called Mani. The camera then swoops to a regal looking Kanika in a teal-colored saree holding a bow and an arrow to shoot a tiger that’s feeding on the live-stock of villagers near Bithoor. It’s in slow-motion and shot majestically almost frame-fitting Kangana in a regal Raja Ravi Verma kind of painting. The shooting scene looks staged, the tiger looks fake, but Kangana’s Mani looks an applause-worthy combination of regal and real: It’s then, that it should hit you, or hits you, that this would be a Kangana vehicle throughout. The speed with which she’s introduced right within the first reel, would be another clear-cut indication of what we are about to see. Everybody knows the history of Rani Laxmi Bai, a Karhade Brahman brought up with all the Kshatriya warrior skills by the Peshwa of Bithoor. So, she rebels, she questions, but she marries the King of Jhansi, Gangadhar Rao. And then she questions the Rajmata and the council of ministers there too. She tames a wild horse unabashedly when she’s being applied henna on the day of her marriage. [When asked, she says she used the occasion just to dry her henna!]. This streak of rebelliousness is smartly used and the arc completed later in a scene when Gulam-Gaus (Danny Denzongpa) questions her seeking justice and peace from company interference through a letter—according to him, a sign of weakness just as her husband displayed—addressed to Lord Dalhousie: She says there’s a time for rebellion/revolutions, and there’s a time to lay-low and cut through the waves, and this isn’t the time for revolution just for Jhansi. And then those terrific scenes are counter-balanced with some really shabbily written ones: The scene revealing Gangadhar Rao’s reason for wearing bangles; his sword-fight with Laxmi Bai when he’s sick; and the irritating debates between a highly irritating Suresh Oberoi’s Peshwa and Manikarnika; the truly moronically-shot action sequence—in spirit, this is a finely thought-out sequence which subverts how a woman should be dressed or introduced first to her groom’s family, but execution-wise, it just falls flat—of Kangana climbing onto the heads of her brothers and then the elephant’s trunk. [This climbing over the elephant’s trunk is done-to-death now and is getting on the nerves, right from Bajirao Mastani and now to Manikarnika; poor creatures, it’s always these royals using their trunks as ladders to successes.] The most disappointingly missed shot is that of a pre-build to the iconic remembrance of Laxmi Bai with her kid saddled onto her back: The one shot that needed melodrama in dollops, is perfunctorily dropped onto the audience with Laxmi Bai just riding on, unknowingly, to the soldiers, and more disappointingly, to the audience, onto the ramparts of the fort with her son saddled onto her back. Where’s the thrilling build-up to the scene? Of her desperately picking up her son and tying him onto her back? Where’s the scene that shows her desperation and her determination? How could they goof up here? The most potent and iconic image in history of Rani Laxmi Bai, then, is reduced here to a mere gesture. Of course, in the previous scene, the one truly electrifying scene in the film, shows Laxmi Bai taking on more than a bunch of Britishers single-handedly, cutting them down to size in real-time at the speed of lightning, with absolutely no slo-mo shots, and at the end, standing on a heap of dead-bodies with blood spattered against the walls of a Kali temple: Cinematic grandeur at one of its best with fine tribute to the legend associated. The film should have been ornamented with more of such scenes, but it isn’t. And then again, as always, there’s the painful depiction of the British. [Come to think of it, the only film that has managed to capture the British talking a mixture of English and Hindustani, smoothly, evenly, is LAGAAN, an entirely fictional story.] The audience keeps getting googly-balled between the angrez’s Hindi and English: You never know when and in what context they could use English or accented-Hindi. You just hope that a day won’t come when a British Officer talks in English when he is talking of relieving himself and then, coming back, launches into detailed war-strategy in Hindustani. And that’s actually the case here. There are long passages in English especially between Hugh Rose and his juniors; and there’s just no sub-titling in Hindi! And then there are sentences that are so much broader in scope that are uttered in Hindi, but ones, that anybody could understand. The battles scenes are finely shot and flip-flop between bare-brutal scenes [head being slashed like a water-melon] and sword-fights of fancy. They are done well though, and have a credence to them. In the climactic battle, yes, it goes onto a slo-mo 300-esqe zone what with Kangana symbolically slashing the Union Jack and with long-staring camera-games at the actress. It does make cinematic sense, though; it’s after-all, the climactic culmination of a legend trying to be wedded onto a cinematic opera-piece. Of the actors, Suresh Oberoi and Kulbhushan Karbhanda are truly incorrigible. All that Karbhanda does is manage his constipation-afflicted dialogue delivery with a slower pacing. Suresh Oberoi is so smug and happy, one wonders whether he’s playing the Peshwa without a pension or celebrating some-where-possibly-in-the-near-future Vivek Oberoi’s seeming success. [The great Peshwa also calls the empire, ‘Marathi’ empire instead of ‘Maratha’, go figure.] Anita Lokhande is passable. Danny Denzongpa plays himself. It is Rajmata, and Sunder-Munder, though present on the screen with no longer than 4-5 minutes that are effective in their miniscule roles. And then there’s the finely portrayed Tatya Tope by Atul Kulkarni, conveying the vigilance, vehemence, and dare-devilry of a true-blue warrior, chips of which are brought onto the screen at pertinent times. Mohammad Zeeshan Ayub is so ordinary, it could have been played by me with extreme make-up. Kangana, of course, channelizes her life as a film-heroine sans nepotism and a small-town girl into the Laxmi Bai of Jhansi, and with fine flourish. At times, it feels this is an extension of Kangana, with all her weaknesses, her controversies, and her haughtiness, and sometimes down-right idiotic statements—[‘I am young, we are North-Indians, and we are fair-skinned’; this on the Karan Johar show]—extrapolating onto a historical figure in a different time-period; but then, she does surprise us with her better voice-modulated performance: The one pain-point of hers, she has worked hard on here, especially when it comes to high-pitched war-cries of ‘HAR MAHADEO’ or her patriotic-burst on the Gwalior fort. Her eyes widen at the right time and her voice matches the thought-process going on in Lakshmi Bai’s mind at that moment, and that’s no mean achievement. And there’s no doubt that she roars into form in her fiery avatar. Overall, this is definitely a good tribute to Lakshmi Bai, but sure as hell, could have been better. There’s Lakshmi Bai protecting the younger version of a cow, there’s Lakshmi Bai saying English is merely a skill to the Indians but not a culture, there’s Pathans joining hands with Lakshmi Bai and launching into ‘HAR HAR MAHADEOS.’ And then there’s Uri. And then there’re the elections. A ‘colorful’ year ahead. This entry was posted on January 26, 2019 at 12:50 PM and is filed under the good. You can follow any responses to this entry through the RSS 2.0 feed. You can leave a response, or trackback from your own site. From the title to the last para, the review is funny and entertaining. Never had a good time before while reading a review. This shows a golden opportunity to depict Rani Laxmi Bai has been lost again. In this thread, i am giving an idea to filmmakers – To make a movie on Discovery of India. Nehru’s book was highly publicised and is used to teach us history. There was also a highly ignorable series – Bharat Ek Khoj that was made by Shyam Benegal. The series may be loved by critics but it was boring. Infact i disliked it. The only episode i had liked was that of Rani Laxmi Bai. This series needs to be revived and presented to us in a better way. Any one endorsing this thought? LOL, loved reading the review. would be interesting to know which part Krishna directed and which part by Kangna. Speaking to Spotboye, the south Indian director went on to explain how much of the film has changed under Kangana’s direction; the actor has said she has majorly reshot the film. “Kangana has done 20-25 per cent of the first half and 10-15% in the second half. I didn’t shoot a song and I didn’t shoot her entry scene. In the second half, she has even re-shot some scenes which I had done in a different way,” he said in the interview. Krish went on to say that the roles of other actors in the film have been truncated. It’s a good film; am not sure why you are ‘planning’ to avoid this. I had high expectations which weren’t met; doesn’t mean it’s not good..
Few Indians may know that the British, who fought the plucky Rani Lakshmi Bai of Jhansi during the Great Indian Mutiny of 1857-58, also admired her greatly. Her enemies on the battlefield and the political bigwigs of that time, openly acknowledged that she was a rare combination of bravery, intelligence and administrative ability. And interestingly, many were in raptures over her personal charm and beauty. She was a “man among mutineers,” wrote Sir Hugh Rose, who led the British forces against her. “She used to dress like a man (with a turban) and rode like one. Not pretty and pock marked with small pox, but beautiful eyes and figure,” noted Lord Canning, India’s first Viceroy, in his private papers. “She was a good looking woman, rather stout but not too stout,” wrote John Lang in Wanderings in India (1859). “Her face must have been very handsome when she was younger. Even now it has many charms,” Long, who knew her, said. According to him, the expression was very intelligent, the eyes were particularly fine, and the nose very delicately shaped. She was not fair though she was far from dark. “Her dress was plain white muslin, so fine in texture and drawn about her in such a way that the outline of her figure was plainly discernible – a remarkably fine figure she had. What spoilt her was her voice(! ),” Lang noted. There is some doubt about Lakshmi Bai’s age at the time of the mutiny. Christopher Hibbert in his Great Mutiny (Penguin, 1978) says that she was in her early thirties, but others put her age at 23 (born in 1835). Quoting JH Sylvester’s Recollections of the Campaign in Malwa and Central India (Bombay 1860), Hibbert says that the Rani was to acquire amongst British officers an “undeserved reputation for excessive lasciviousness.” But in the opinion of Sir Robert Hamilton, Resident in Central India, she was a “civil, polite and clever young lady,” who had all the qualities to be a good ruler. Quite a chauvinist and sexist remarks here. This makes Kangana a bigger draw at Box Office than Hrithik Roshan. In fact latter’s movie Super30 would not have got an opening if it were to release on the same day. Kangana all the way so far!!! “I chose to remain silent before the film released because there was no way I could sabotage a film that had the efforts of so many people at stake… I did not want to re-live what I had endured. I had to move on for my own sanity,” he added. Have you seen these amazing behind-the-scenes pictures? Kangana Ranaut may be the face of Manikarnika: The Queen Of Jhansi, but there has been an army to support her in the endeavour and make her look as regal and royal as she does in the film. The secret behind her fabulous royal robes in the film is Neeta Lulla, and Neeta’s Instagram feed is a treasure trove of amazing pictures of how she managed to achieve the feat. Even the smallest details was put together very painstaingly by the designer and her team. Kangana Ranaut’s latest film Manikarnika: The Queen of Jhansi is a success story which Bollywood trade analysts swear by. The film made close to Rs. 50 crore in four days of its release despite poor reviews (NDTV’s Saibal Chatterjee gave the film 1-star rating) and the controversy about the film’s directing credits. “It’s a Herculean task well achieved,” trade analyst Girish Johar told news agency IANS and added Kangana’s job was to ‘draw the audience to cinemas, in which she succeeded.’ Kangana Ranaut’s last few films – Katti Batti, Simran and Rangoon – did not perform well at the box office, which meant that the success of Manikarnika was crucial for the actress. When asked if Manikarnika is Kangana’s return to the box office game, industry expert Vinod Mirani told IANS: “Return? She has always been around.” Kangana has also starred in commercially successful films like Queen and the Tanu Weds Manu series. “Well established stars, especially good actors don’t fade out. A lot of stars like Akshay Kumar and Ajay Devgn have given a line-up of flops but they come back when a script is good,” Vinod Mirani added. “She carries Manikarnika solely on her shoulders. The film’s budget is high but the ladies audience is expected to salvage it,” Mr Mirani added. 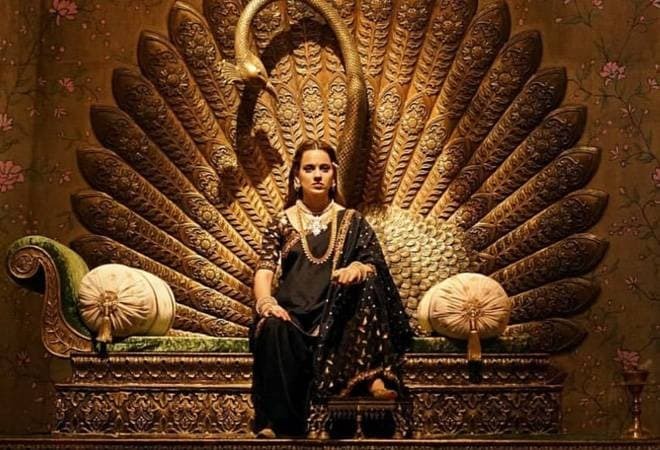 Meanwhile, soon after the release of Manikarnika, co-director Krish contested Kangana’s claim as the film’s first director stating that 70 per cent of the film’s final version was shot by him. Kangana’s sister Rangoli Chandel, also her manager, tweeted that contrary to Krish’s allegations, Kangana has filmed most of Manikarnika and if he can prove otherwise the actress will apologise and take back her name. Actress Raveena Tandon was also impressed with the film and Instagrammed: “Directing this magnificent extravaganza seems like a challenge which you have successfully and effortlessly fulfilled.” Madhur Bhandarkar, who directed Kangana in Fashion, tweeted: “Your flawless performance is captivating, intense, controlled, with sheer brilliance. You deserve all the accolades and awards for ‘Manikarnika’, hands down,” Bhandarkar tweeted. Manikarnika: The Queen Of Jhansi is based on the life of Rani Laxmi Bai, who valiantly fought the East India Company in the Indian Rebellion of 1857. The film also stars Ankita Lokhande, Jisshu Sengupta and Atul Kulkarni. “Whatever they are showing in the film Manikarnika, I feel I was like that. A woman can also take the avatar of goddess Durga,” she said. After being expelled from the Samajwadi Party, she formed her own party – Rashtriya Lok Manch – along with Amar Singh. The party fielded a number of candidates in 2012 Uttar Pradesh assembly polls, but none won. Amar Singh was recalled to the Samajwadi Party in 2016, but was sacked after Akhilesh Yadav took over the party. Both the leaders still have bitter ties with Azam Khan. Recently, Jaya Prada said the character of ruler Alauddin Khilji reminded her of Mr Khan. In October last year, Amar Singh filed a police complaint against Mr Khan for allegedly threatening his daughters with acid attack. Everyone is going wah wah on Andhadhun. But emotionally I connected to Kaabil more than Andhadhun. Maybe I am not pseudo intellectual like those critics and critical minded. I am posting it here because I feel Manikarnika must also be a good movie inspite of being ridiculed. Dont go by critic’s word to watch a movie. Just go by your instinct. Kangana Ranaut’s Manikarnika: The Queen Of Jhansi releases this week, a cinematic tribute to one of India’s most courageous monarchs. In this fascinating excerpt from Moupia Basu’s new book The Queen’s Last Salute, the British conspire with Indian malcontents to bring Rani Lakshmibai’s empire under the Englishman’s yoke. probably KR is just going Parveen Babi route? loosing her mental balance and badmouthing everyone and anyone who does not suit her whims? ?